New psychoactive substances (NPS), also known as ‘legal highs’, ‘bath salts’ or ‘research chemicals’, appeared on the drug market around a decade ago. Even though they account for only a small proportion of the market, NPS encompass a group of over 700 different substances. In 2014, the life-time prevalence of NPS use for young European adults (15-24 years) was 8%. While the prevalence and the use of NPS is steadily increasing, data on pharmacological, toxicological and clinical effects is limited. Considering the large number of NPS available, there is a clear need for efficient in vitro screening techniques that capture multiple mechanisms of action. Fig. 1. Illustration of a multi-electrode array (MEA) plate with 48 wells (A), each containing 16 electrodes, which can be measured in the Maestro (B) to record local field potentials on single electrodes (C) and all 16 electrode in one well (D). Concentration-response curves can be obtained by expressing data from baseline and exposure recordings as treatment ratios, expressed as % of solvent control (E). Recently, neuronal cultures grown on microelectrode arrays (MEAs; Fig. 1 A-D) have proven to be suitable for neurotoxicity screening of pharmaceuticals, toxins, chemicals and (illicit) drugs. Using this method, valuable information can be obtained quickly by investigating effects on neuronal activity as an integrated endpoint of underlying effects on all targets affected within the neuronal network, including different ion channels, neurotransmitter receptors and compensatory mechanisms. We therefore used rat primary cortical cultures grown on multi-well MEA plates to investigate the effects of eight NPS (PMMA, α-PVP, methylone, MDPV, 2C-B, 25B-NBOMe, BZP and TFMPP) and two ‘classic’ illicit drugs (cocaine, methamphetamine) on spontaneous neuronal activity. All tested drugs rapidly and concentration-dependently decreased the weighted mean firing rate (wMFR) with IC50 values ranging from 2.4 µM for 25B-NBOMe to 234 µM for methylone. Also the weighted mean burst rate (wMBR) was inhibited with IC50 values in a range of 3.3 µM (25B-NBOMe) to 246 µM (methylone). The observed broad range of IC50 values hints to the possible existence of distinct structure-activity relationships (SARs). By including data from our previous studies, we are able to compare the effects of 16 illicit drugs and NPS from different classes on spontaneous neuronal activity. Firstly, all amphetamine-type stimulants (amphetamine, methamphetamine, MDMA, PMMA and 4-FA) inhibit the wMFR with IC50 values of ~100 µM. Small changes in the chemical structure of this group, like the addition of a fluorine atom, and a methoxy or methylenedioxy structure, do not change their potency to inhibit the wMFR (Fig. 2). Secondly, the addition of a ketone group to the MDMA structure, resulting in the cathinone methylone, decreases the potency of the compound to inhibit the wMFR 2-fold (IC50 values 106 µM vs 234 µM, respectively)(Figure 1E). On the other hand, the cathinones MDPV and α-PVP (IC50 values of 29 µM and 21 µM, respectively) are ~10-fold more potent than methylone. This may be due to the addition of a pyrrolidine structure (Fig. 2). This notion is further supported by the potent inhibition by cocaine (IC50 value 9.8 µM), which contains a tropane structure that includes a pyrrolidine structure (Figure 1E). Comparable 10-fold differences in potency were also observed between the hallucinogenic phenethylamines 2C-B (IC50 27 µM) and 25B-NBOMe (IC50 2.4 µM), and between the piperazine derivatives BZP (IC50 161 µM) and TFMPP (IC50 19 µM) and mCPP (IC50 32 µM)(Fig. 2). Finally, of all compounds tested, the arylcyclohexylamines ketamine and methoxetamine (MXE) most potently inhibited wMFR with comparable IC50 values of 1.2 µM and 0.5 µM (Fig. 2). Fig. 2. 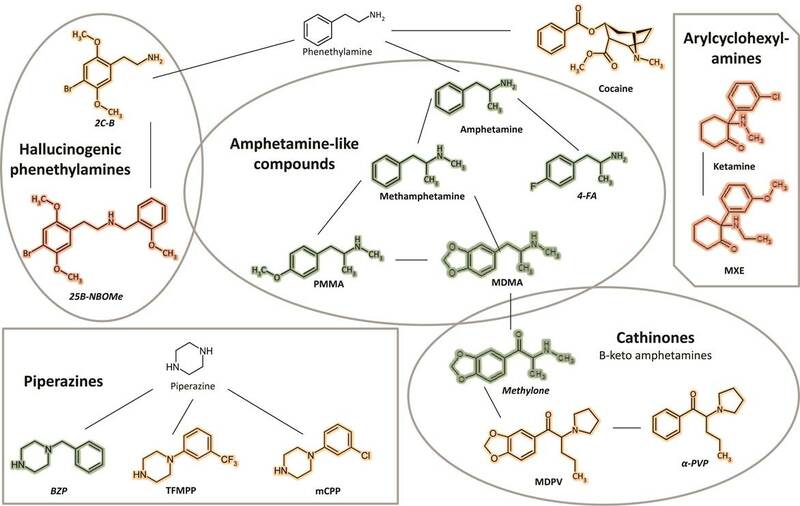 Chemical structures of illicit drugs and NPS, categorized based on chemical similarities and potency to inhibit neuronal activity. Chemical classes depicted are amphetamine-type stimulants, hallucinogenic phenethylamines, cathinones, piperazines and arylcyclohexylamines. Compounds with comparable structures are linked by black lines. Colors represent the potency of a drug to affect neuronal activity: green (IC50 values ~100 μM and higher), orange (IC50 values ~10 μM) and purple (IC50 values ~1 μM). Drugs with IC50 values not within or close to 2 times the estimated human brain concentration are listed in italic. For most drugs, IC50 values are close to the estimated human brain concentrations following recreational doses of these drugs, highlighting the importance of this efficient in vitro screening approach for classification and prioritization of emerging NPS. Moreover, the wide range of IC50 values observed for these and previously tested drugs of abuse, both within and between different classes of NPS, indicates that additional investigation of structure-activity relationships could aid future risk assessment of emerging NPS. Neurotoxicity screening of new psychoactive substances (NPS): Effects on neuronal activity in rat cortical cultures using microelectrode arrays (MEA).